More Fun at Three Rivers, or Ivy Woodrose is simply charming! 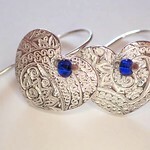 I have loved jewelry for ages. Not mass-produced jewelry, but special kinds of pieces ranging from unique antiques to modern artisanal pieces. Talking with colleagues as we staffed the Arsmiths of Pittsburgh booth at the Three Rivers Arts Festival yesterday, I noted that it’s an interest I shared with my mother. Kate said that, in contrast, she and her mother did not share that at all. Now, it’s not that my mother and I liked the same pieces: our tastes were not mere miles apart, the scale was more like galaxies. But we did both relish finding unusual pieces, and we could pretty reliably spot something that the other would just love. This was in complete contrast to clothes: we could rarely buy clothes for the other that the recipient could even tolerate. But we had great success with jewelry exchanges! And then there were further delights when, shopping for the other, we’d also find treats for ourselves…. 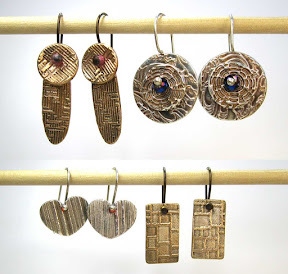 In the 1990s, I started experimenting with making some jewelry. My earliest attempts were simple beaded creations of various sorts. I also dabbled a bit in glass-work and polymers and wood and more, but never felt the urge to go full-scale on any of those. 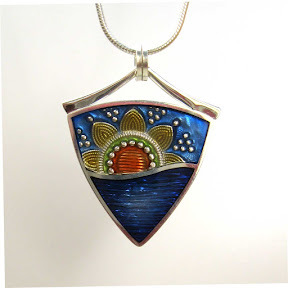 Long before that I’d also dabbled in traditional metalsmithing and pottery: those were both far more interesting to me than later media but still had not completely grabbed me. I first heard about metal clays while I was in my beading heyday but for various reasons (including but not limited to a more-than-full-time academic post) I just wasn’t able to pursue it at all at that time. A few years later, enough had changed in my life that I could try to pursue it. I started out slowly but, eventually, I decided to kick it up a notch, moving things off the tray-table in my guest bedroom and into a full-scale studio. By then, my mother was gone and, in fact, I used a fair portion of my “inheritance” from her to set all that up. I figured, if it didn’t work, at least I’d know that I’d tried but, if it did work out, I’d have her (and my dad) to thank for it. The thing is that now, since both my mother is gone and I’ve started seriously making more jewelry, I’ve pretty much stopped buying it for myself…. Clearly, I can wear anything I’ve made whenever I want (until I sell it), but an even bigger part of it is that I do have a fair amount already, not a whole lot, but enough that I certainly don’t need any more. I still enjoy looking at it, and I believe in helping support other artists, so I do still buy pieces now that I can give as gifts. 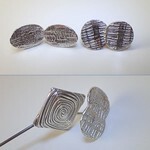 I’ve continued to buy non-jewelry art for myself and I’ve exchanged pieces with other jewelry artists. I also make a point of taking several of my art- and jewelry-loving friends to shows where I know there will be art jewelers whose work I think they’ll like, and encourage their purchases. But I’ve bought very little jewelry for myself. But more than zero. 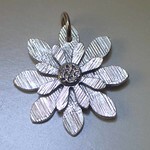 And today was one of those “exception” days: I bought a pendant from Ivy Woodrose (aka Ivy Solomon)! I’ve admired her work for years!! I never imagined meeting her in person but there she was, two booths up from the Artsmiths this weekend! I asked if she’d been there before and I’d somehow missed her but no, this really was her first time at Three Rivers. I went up yesterday and gushed and drooled and embarrassed her with my admiration, then went back today with some cash and, after a very lengthy and delightful discussion about techniques and products and sources with this absolutely charming artist (and her congenial husband), I actually bought a piece! Where land meets water. Where earth meets air. Where body meets mind. Where space meets time. 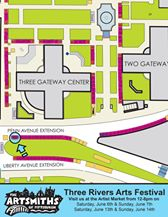 Another June Event: The 2015 Three Rivers Arts Festival begins at Noon Today! The 2015 Three Rivers Arts Festival opens today (June 5) and runs through Sunday a week later (June 14). The Artists Market will be open each and every day from 12 Noon to 8 pm each day. Since there will have to be two rounds of setting up and taking down the booth, on top of new artists with new media to offer at the festival, Koolkat has decided that the only Artsmith’s jewelry that they will carry will be earrings. So that’s all they’ll have of my wares. Here’s a photo with a small sampling of what will be in my section of the booth. I am scheduled be in the booth on Saturday, June 6, from 4 to 8 pm. If you’re around then, do stop by and say “Hello!” Music-wise, that Saturday is what’s being called Bluegrass Day at the festival itself, but just across the river in Heinz Field (where the Pittsburgh Steelers play football), will be the ‘burgh’s offering of the #1989WorldTour by Taylor Swift. Ah, yes, I’ve always considered 1989 a memorable year too: should you stop by the booth while I’m there, do feel free to ask me to share one of my stories from htat year….! Since I’ll only be working one half-shift, I’ll have plenty of time, off and on, in the market and elsewhere, to just enjoy all the music, art, artists, art-lovers, creativity, makers, and more, filling up the downtown area for those ten days. So do let me know if/when I should be looking out for you at the Festival! It’s looking like a busy month. I hope I can remember to post all the various announcements! First of all, there’s the inaugural 2015 Members Show with the Cranberry Artists Network (CAN). I’ve had two pieces accepted for this show (my first since being selected as a member). 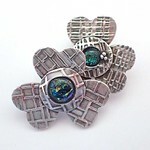 I chose to enter two reversible pendants. 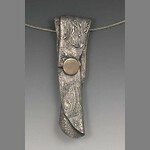 One is made from fine silver (.999) that I’ve hung on a sterling silver (.925) chain. It’s about an inch across, and composed of three separate layers. The middle layer has a texture pattern that displays concentric circles. A good portion of that is visible through an overlay, a highly polished disk with lines radiating out of its center, where I’ve been able to cut a circle out of it that aligns with the circles on the middle piece. I’ve centered all of that a little above and to the left of the center of the piece: that positioning reminds me of the rising sun, which has always been a part of my vision for this side. There’s a third overlay, placed on the “back” of the inner-circles piece. It displays a textured pattern of (sun-drenched, perhaps) gingko leaves and is embellished with a lilac-colored corundum stone. I don’t know if there is an “official” name for that pale purple stone, other than simply lilac-colored corundum but, if you’re not familiar with it either, just know that rubies and sapphires are also forms of corundum. I do apologize for the quality of the photo, though: tiny shiny objects are just such a challenge to get right…. My second piece in the show is more of what I’d call an “entry level” piece, deliberately kept relatively simple in order to keep the price down for the beginning collector. 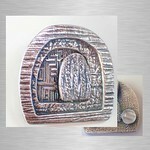 This one is made of bronze; it’s a little over an inch across and is another of my reversible creations. One side is a textured and domed disk with a single strip overlay as embellishment, which I see as simple but elegant. The other side is then concave, with a faceted stone set into a hand-formed bezel and nestled down into the curve, to help make that side special too. This stone is in the cubic zirconia (CZ) family, a purple color that the vendor calls “Lavender.” This one is hung on a brass chain, one that’s in a style I seem to have been using fairly frequently lately. The show runs from June 3 through 25 at the Cranberry Township Municipal Center, 2525 Rochester Rd., Cranberry Township, PA 16066. The Opening Reception will be on Wednesday night, June 3, from 6 to 8 pm, with lots of good refreshments to complement the delightful art. I’m going, and it’d be great to see a few “locals” there! And for several weeks afterwards, you can still check out all the great art in this show any time the municipal center itself is open.